In patients with very thick psoriasis plaques with micaceous scale, phototherapy alone may not be adequate, as UV light cannot penetrate through thick, hyperkeratotic lesions. 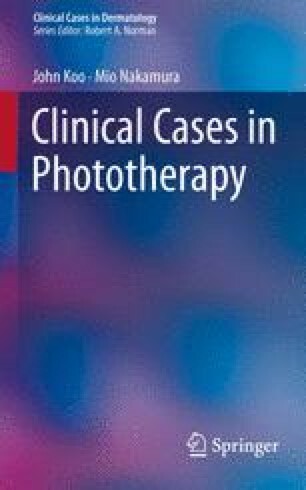 In such a case, the addition of a systemic retinoid, namely acitretin, will likely thin the plaque and enhance the effectiveness of phototherapy. When acitretin is added to an already maximized phototherapy regimen, the dose of light should be reduced by 50%. Alternatively, acitretin can be started 2 weeks prior to starting phototherapy in which case the dosimetry can be initiated and increased per protocol. The effective cumulative doses of UVB and PUVA are often much lower in combination with a systemic retinoid.